Yes I know, the title of this post is a cliché, but it’s still true. The PSBA 3rd Annual Members Exhibition in Collins Library at The University of Puget Sound has been a very good thing and it comes to an end on July 31st. Each year, the show is more impressive than the year before, and next years already eagerly anticipated exhibition should be no exception. How important was this exhibition? 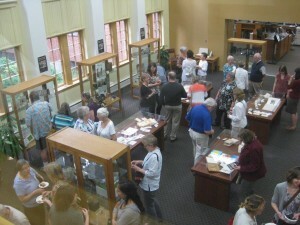 From the opening nights reception on June 6th, to always heavily attended “Conversation With The Artists” on June 20th, the Puget Sound Book Artists 3rd Annual Member’s Exhibition garnered reviews from the length and breadth of Puget Sound and as far away as the United Kingdom. Below are a few links to everything you wanted to know about the 3rd Annual Members Exhibition; from interviews with the artists, to information about the exhibit itself, to thoughts and comments by the artist themselves. To those book artists who are members of the Puget Sound Book Artists, Congratulations for a job well done! To those who are not members but would like to learn more about us, enjoy! For those who were not able to visit the exhibition but wanted to, visit Blurb or click on the Publication tab to obtain the catalog from the exhibit.